Inventory Management isn't easy. If it were, more companies would be good at it. But being competent at managing your inventory isn't all that difficult either. It just requires that you invest the time to develop an understanding of the factors that should be affecting your inventory management decisions. Then use this understanding to start to put together the calculations and decision logic you will use to manage your inventory. Explained. Calculations for forecasting, lot sizing, and safety stock are well known to the inventory management community, but are generally not understood to the level necessary to effectively use them. This lack of understanding results in incomplete calculations, incorrect inputs, flawed logic, or a fall-back to less effective, keep-it-simple approaches. Inventory Management Explained helps readers build a solid understanding of the key planning aspects of inventory management. It does this by clearly explaining what inventory management is, but then goes well beyond typical inventory management books by tearing apart the calculations and logic we use in inventory management and exposing the hidden (or not so hidden) flaws and limitations. It then builds on this by showing readers how they can use their understanding of inventory management and their specific business needs to modify these calculations or develop their own calculations to more effectively manage their inventory. The emphasis on practical solutions means readers can actually use what they've learned. For those new to inventory management, the author includes highly detailed explanations and numerous examples. Instead of archaic mathematical syntax, the author explains the calculations in plain English and uses Excel formulas and spreadsheet examples for many of them. For the experienced practitioner, the author provides insights and a level of detail they likely have not previously experienced. Overall, Inventory Management Explained does actually explain inventory management, and in doing so, exposes the good, the bad, and the ugly aspects of it. But more importantly, it leaves the readers knowing enough to be able to start making smart decisions about how they manage their inventory. What inventory is and why we carry it. Various manufacturing and procurement strategies. The primary tasks involved in inventory management. Different types of inventory management software. Why Keep-it-simple methods for calculating safety stock don't work. The problems with oversimplified applications of statistical safety stock calculations. What the Normal Distribution model is, and why it applies to safety stock calculations. Why the "service level" element of statistical safety stock calculations may not be what you think it is. How to modify your safety stock calculation to account for your forecast, lead time, and order cycles. How biased forecasts and negative variability affect statistical safety stock calculations. Exactly what EOQ is, where it came from, and what all the numbers mean. Why EOQ and related calculations have gotten a bad rap over the years. How to determine what goes into Order Cost. How to determine what goes into Carrying Cost. When costs may not apply. How to set up a cost-based order quantity calculation in Excel that takes into account Quantity Discounts. Ways to deal with seasonality and trend in your order quantity calculations. How to use Period Order Quantity. An intro to the use of Optimization in lot sizing. The difference between analysis and measurement. Understanding and measuring Fill Rates and On-Time Delivery. The importance and complexity of out-of-stock analysis. How to calculate Inventory Turns and why I consider it to be one of the most overused, misused, and abused calculations in business. How to incorporate ABC stratification into your analysis. How to calculate Gross Margin Return on Inventory Investment (GMROII), why you would want to use it, and how you can make it even better. How to identify and monitor Excess and Obsolete inventory, and what to do about it. How to more effectively measure Forecast Error. Why supplier performance measurement is not as simple as you think. What's wrong with your inventory reduction strategy. What "Cheats" are, and why inventory management is full of them. What Vendor Managed Inventory (VMI) is and why you may or may not want to use it. What Consignment Inventory is and why you may or may not want to use it. How Postponement can reduce your inventory investment. How to determine if overseas sourcing is worth it. 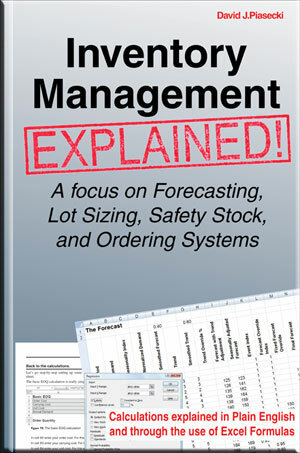 Title: Inventory Management Explained: A Focus on Forecasting, Lot Sizing, Safety Stock, and Ordering Systems.